The assumption underlying the first question in this game is that all things fall into two categories: non-living and living, and that all living things are either "animal" or "vegetable." Oh happy, innocent times! It was not long before we learned that biologists in fact distinguish five kingdoms of life: animals, plants, fungi, bacteria, and protists, the latter including all the single-celled forms that are not bacteria. Even just ten years ago, this was the standard textbook classification. Although it was known that some strange life forms could not be readily accommodated by this scheme, the classification was retained because it works well in describing the various relationships of organisms with which most biologists are familiar. The five kingdoms are handy, but they contain a fundamental flaw. The category of "bacteria" contains organisms that are much more different from each other than are mosses from mammals and mushrooms. Thus, the arrangement is entirely asymmetric. It is a bit as though, when classifying mammals, we had used the categories cattle, horses, dogs, pigs, people and all other (including whales, bats and kangaroos). Why did such an asymmetry arise in the first place? Because we tend to classify familiar things to a level much more detailed than those things we are unfamiliar with. Bacteria are invisible and unfamiliar. So they got one big catch-all kingdom. Animals, vegetables and fungi are familiar and clearly different from each other. So they each got their kingdom. Protists (the animalcules of Leeuwenhoek) had to go someplace else. So they got their kingdom, too. That made everyone happy. At least, that is, until Carl Woese came along and analyzed the chemistry of the organisms. The chemistry turned out to be incompatible with the accepted scheme. Carl Woese used the new tools of molecular biology, starting in the 1970s, to find out which organisms are alike and which aren't. First of all, he discovered that differences between "animals" and "vegetables" are minor, compared with differences between those two and everything that had been lumped into "bacteria." 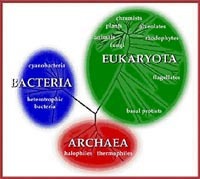 Not only, seen against this background of total variation of life forms, are trees and lizards practically indistinguishable, but also mushrooms and ciliate protists are part of this closely knit group of "eucaryotes" or "eukarya." More or less, they all belong to the same kingdom. In contrast, the so-called "bacteria" proved to have an incredible range of different life forms, as reflected in the variety of their genetic molecules of ribonucleic acid (RNA). Based on chemical similarity, two large groups can be recognized, which Woese called the "archea" and the (true) "bacteria." Thus, following Woese, there are really three large groups of organisms: the "eukarya" (everything from Paramecium to people and including slime molds, sponges and tomatoes), the "bacteria" (from the "blue-greens" or cyanobacteria to the "red snow" bacteria abundant on some melting snow fields, and including many troublesome germs), and the "archea" (methane makers, sulfide handlers, and thermophiles, among others). Why did it take so long to identify the archea as a separate group, rating a separate super-kingdom? Archea are a bit strange in their life habits, compared with the other two major groups, from our perspective. We breathe oxygen, something that is typical for the eukarya. But an atmosphere with freely available oxygen only dates back to about two billion years ago. The oxygen was created by life forms (cyanobacteria) that discovered how to make a living by photosynthesis, using carbon dioxide to build organic matter. Prior to the buildup of oxygen in the atmosphere, organisms handling methane and sulfur were ubiquitous. Oxygen is poison to these organisms, and they were literally driven underground and into the remaining anaerobic (oxygen-free) environments, or into extreme environments such as sulfur vents and alkaline hot ponds. They really are still all around us; we carry them in our guts along with the familiar bacterium Escheria coli. We have known them for a while (and even have used some of their chemical tricks such as RNA replication at high temperature). We just never realized that they form one big family of specialists for anaerobic and extreme environments.